Both feet separated by a distance larger than shoulder width, soles and heels are touching ground heels slightly lifting. Bend your body, legs leaning back, raise your head and look forward. Both hands are holding and pressing on the chair back, desk or balustrade. 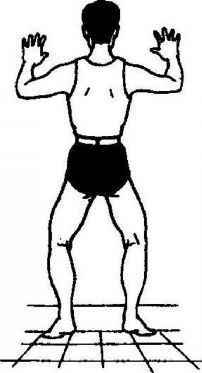 Relax your shoulder and your belly, let your abdomen muscles naturally expanding and contracting (Figure 3-15). 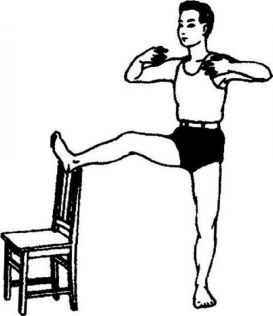 Stand on one leg, knee slightly bending, front leg lifting, toes hooking back, chest slightly withdrawn, head straightening and foot stamping down. Both hands at head level, wrists turning out and fingers supporting, shoulders relaxed and elbows horizontal, back erected and waist straightened, hip tightened and belly inhaling, relax your face and concentrate your mind (Figure 3-34). 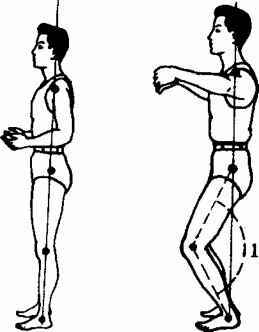 Both feet standing comfortably, rear leg straight, front heel slightly lifted, most of your weight on rear leg. 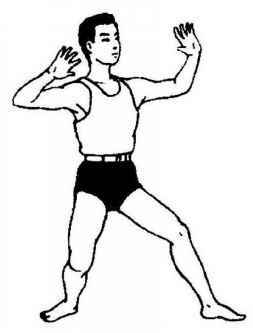 Let's say you are standing with left front leg, left hand should lift to a high level, elbow slightly bending, center of hand facing up, right hand dropping down, center of palm facing down. 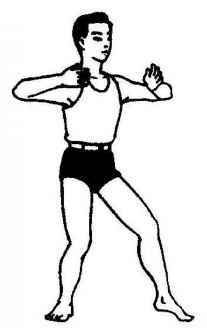 Raise your head face and have your body leaning to the right side Figure 3-17 . 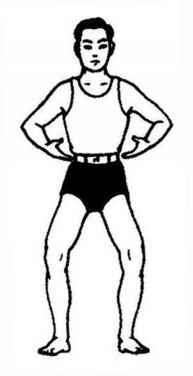 Now you are standing with a right front leg, just interchange hands position while head and body remain unchanged. Both hands and legs can adopt any posture. Shift your whole body's weight on one side by leaning it without exceeding the vertical line passing through your foot This posture will reduce by half the amount of physical effort compared with the standard posture. 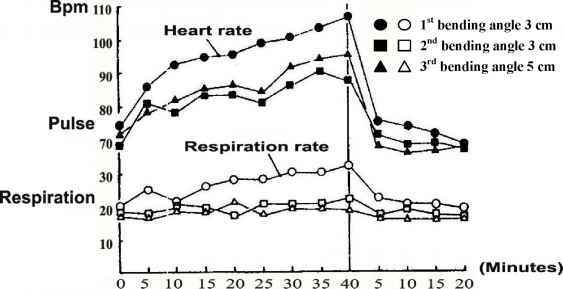 This will also help you to feel in each side the subtle internal changes intervening in your body, you can use it at will with all healing posts Figure 3-16 . Both feet shoulder width separated, both knees bending, hip twisting inward, body leaning backward, knees pointing out, calf stretching up. Place both hands on two sides of belly at navel level, shoulder width, center of palm downward, all fingers naturally separated, your Hukou tiger mouth - space between thumb and index supporting and round, wrists bending up and palms pressing down, head straightening and foot stamping, shoulder relaxed and elbow expanding Figure 3-27 . Both legs are now straight, placed horizontally on the mattress both feet separated shoulder width apart. 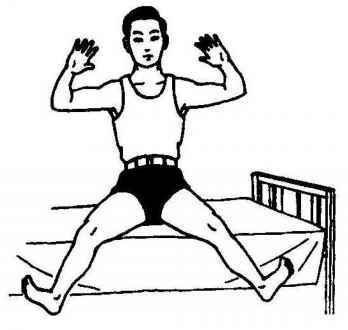 Both elbows separated from the body, resting on the mattress or slightly lifting during exercise. When you are finishing your exercise, drop your elbows, place your hands on or slightly above the belly and finally leave them on the belly when you are tired. 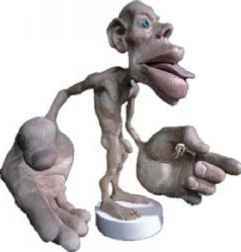 During this exercise fingers should be naturally separated. 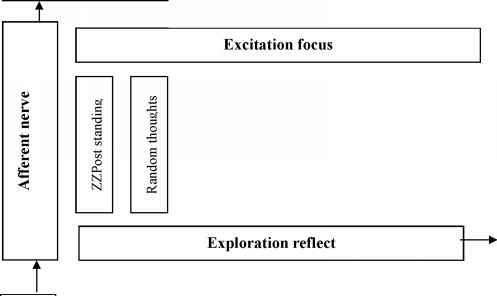 Figure 3-3 . 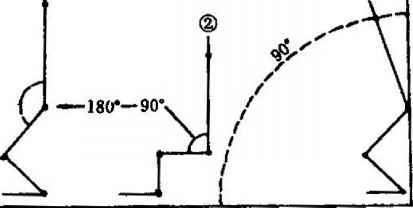 Facing to the wall, both feet separated from wall for about 30 cm. Legs posture is the same as in the First form, soles touching ground, heels slightly lifting. When your calves are too tired just drop them down. Distance between two hands should be larger than shoulder width. Place them at a higher level than your eyebrows, all fingers naturally separated. Let them touch the wall or the tree Figure 3-14 . Lying on your back, both feet shoulder width apart, both knees Lift foot bending, both heels touching mattress and toes lifting up. Both elbows lifting up, separated from the mattress by about 5 to Figure 3-1 10 cm, keep them at this distance. Both elbows are bending, the palm of the hand downward, showing hold object estate, or the palm of the hand upward, showing pushing and supporting estate. 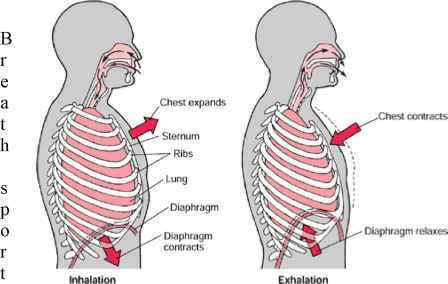 Both shoulders relaxed, do not use force and again do not hold your breath Figure 3-1 . Both legs are assuming previous posture. Both hands lifted at navel level, center of palm facing up as supporting an object, both wrists shoulder width apart, elbow separated from rib, all fingers naturally separated and slightly bending. Back erected and waist kept straight, rise your head like being suspended from the top, eyes looking forward, both shoulders relaxed. Do not use force Figure 3-7 . Sit at the edge of your chair, body erected, both feet parallel, vertical and shoulder width apart, place in front of the chair, sole and heel are all touching ground, thighs and tibias are forming a perfect 90 degrees angle. Elbows separated from ribs, both hands placed on thighs, center of palm facing up or down, back erected, waist stretching, rise your head like suspended from the top, eyes looking forward, both shoulders relaxing. Do not use force Figure 3-6 . 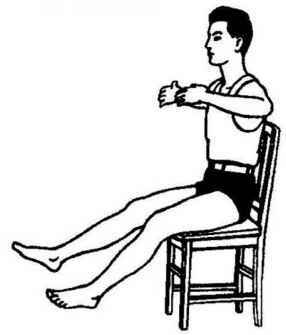 Sit on your chair, knee cleave leaning on the edge of the chair, both legs lifting, separated by a distance larger than shoulder width, adjust the height of your feet depending on your own physical condition. 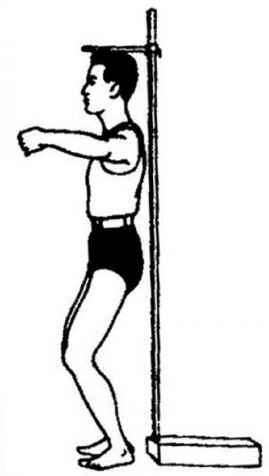 Place both hands below shoulder level and above breast level, center of palm facing in as if holding something, waist and back erected, rise your head like being suspended from the top, look forward, both shoulders relaxed, do not use force and do not hold your breath Figure 3-9 . Both leg posture is the same as in Fifth form. 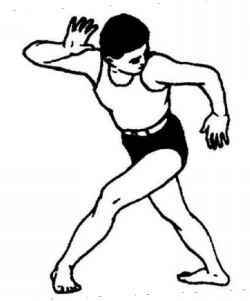 Both heels facing each other, both legs turning outward, toes hooking and bending backward, to increase both legs physical strain. 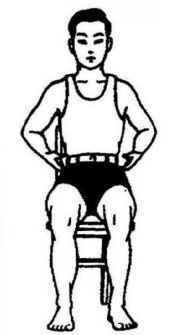 Lifting both hands upward of shoulder and downward of eyebrow, center of palm outward showing pushing and holding estate, waist and back keeps erect, raise your head watching forward, both shoulders relaxed, do not use force and do not hold your breath Figure 3-10 .